Praised for her “big tone and attractive sound”, Sonya Shin, started her violin studies at the age of five. She has won many top prizes in local, provincial, and national competitions over the past twelve years such as the Canadian Music Competition and the Kiwanis Music Festival. Ms. Shin currently studies with Robert Uchida having previously worked with Anne McDougall and James Keene. Other influences include Patinka Kopec, Grigory Kalinovsky, Andrew Dawes, Martin Beaver, and Masao Kawasaki. She is currently Co-Concertmaster of the Senior Edmonton Youth Orchestra conducted by Michael Massey. In 2018, Ms. Shin debuted with the Edmonton Chamber Orchestra performing the Haydn Violin Concerto in C Major. She has also attended many international music festivals such as Morningside Music Bridge, Casalmaggiore International Music Festival in Italy, National Arts Centre – Young Artists Program, and the Aspen Music Festival. She has received many generous scholarships such as the Korean Canadian Foundation Scholarship, the Alexandra M. Munn Scholarship, and The O’Neill Foundation Scholarship. Ms. Shin has also enjoyed being a volunteer for the Edmonton Symphony Orchestra’s YONA-Sistema program for the last three years. She is a grade twelve student at Strathcona High School and will be pursuing her undergraduate degree in the US starting this fall. 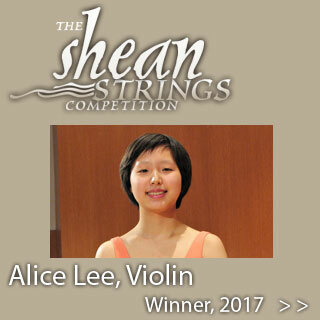 The application process for The Shean Strings Competition 2019 is now closed. We received many applications, and have selected our competitors.